No matter how old you are now, there’s always going to be a degree of nostalgia, of good memories because a small yellow bird with an abnormally large head defeated a lisping cat at every turn, while maintaining its ‘innocence’. 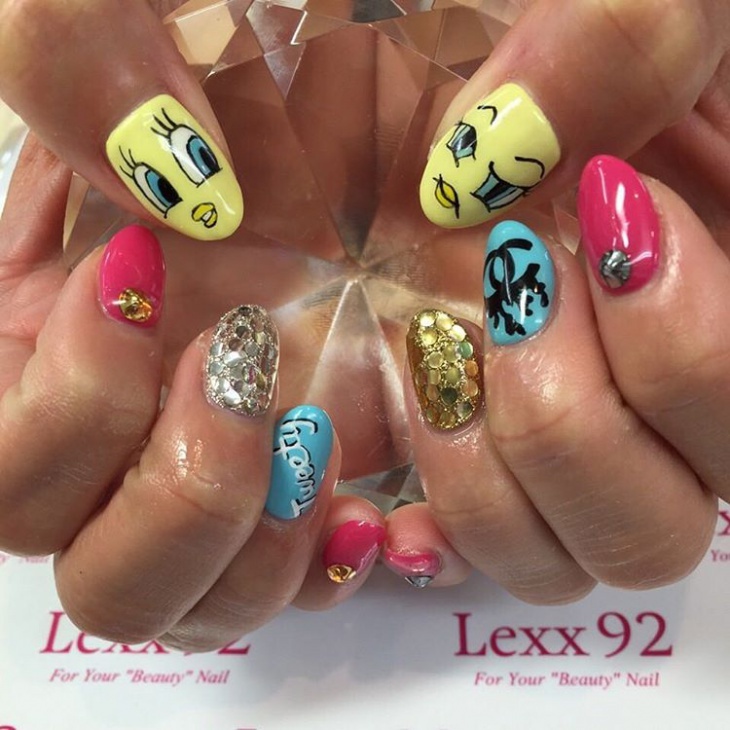 That’s right, we’re talking about age-beloved cartoon character Tweety Bird! Voiced by the versatile Mel Blanc, Tweety’s long lashes and darling blue eyes charmed his way into his viewers’ hearts for more than fifty years. 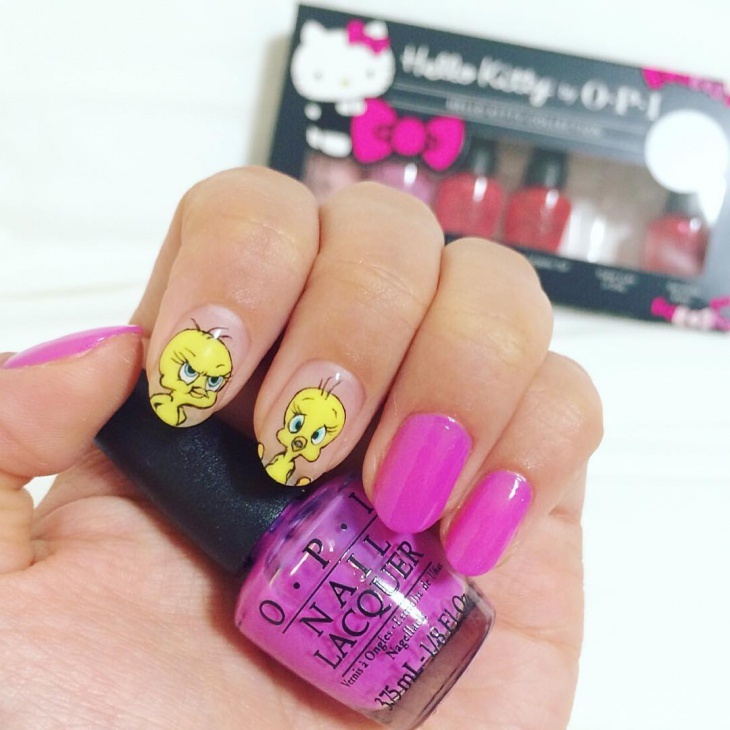 Below, check out some amazing nail art dedicated to him! A superb way to bring your favorite looney (get it?) 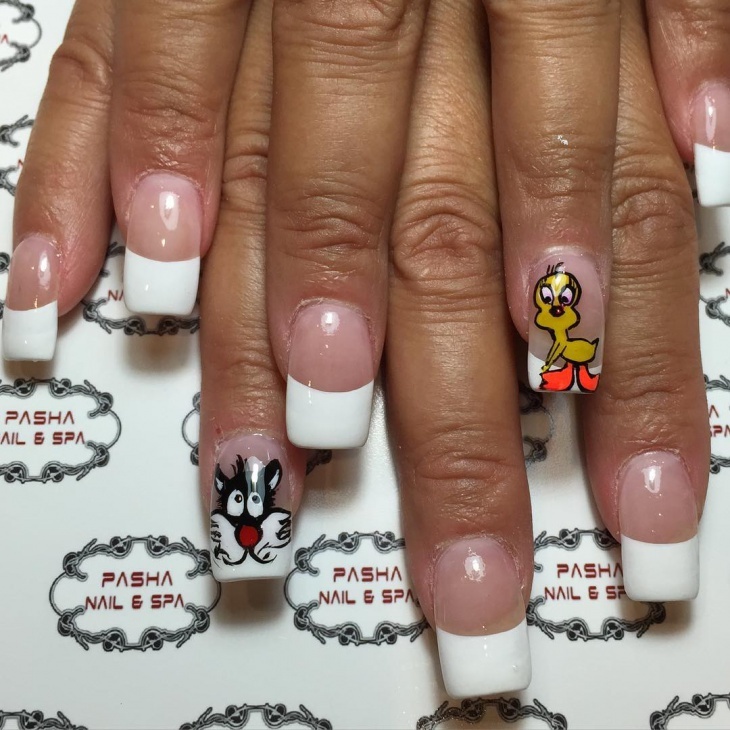 cartoon characters back to life – each animal has been depicted with its signature personality face: a complaining Daffy Duck, a crazy Taz, a twittering, content Tweety, a smugly clever Bugs Bunny, and the cunning (but ultimately hapless) Sylvester! 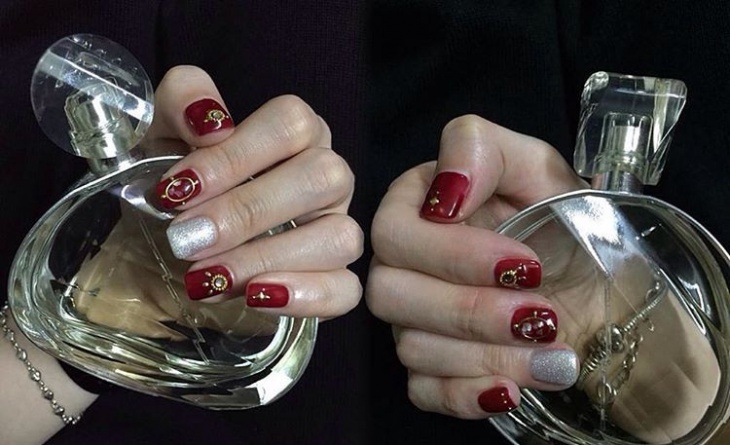 Have superb long nails, but don’t want to follow the mainstream glam? Go back to funky, fun and fantastic! 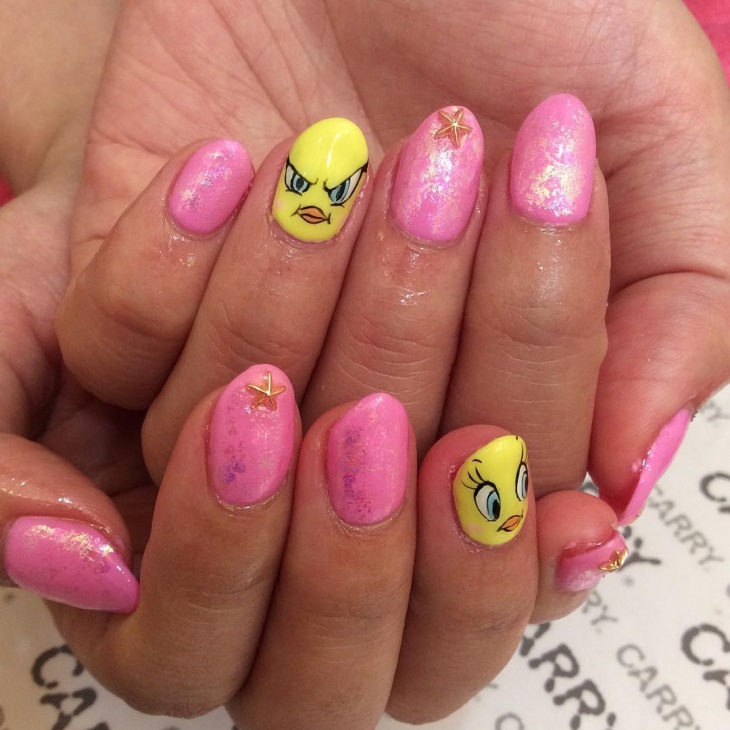 Here’s another piece of Tweety nail art that shows off the innocence ‘back then’ with the yellow shade, while depicting the personalities of each character with cute hearts for Tweety, and a lovely, enticing cage – an empty one as a goal for Sylvester. 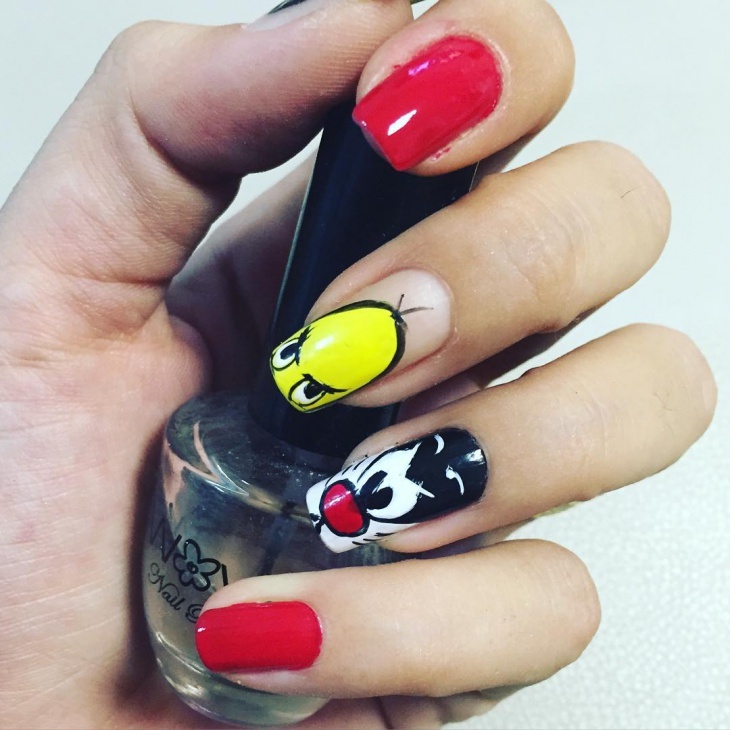 Keeping this simple, sweet and yet totally chic at the same time, this nail art idea opts for Tweety’s signature canary red, giving a summery feel while paying homage to the character with a portrait on the ring finger. The Japanese word for cute, ‘kawaii’, comes to mind here. 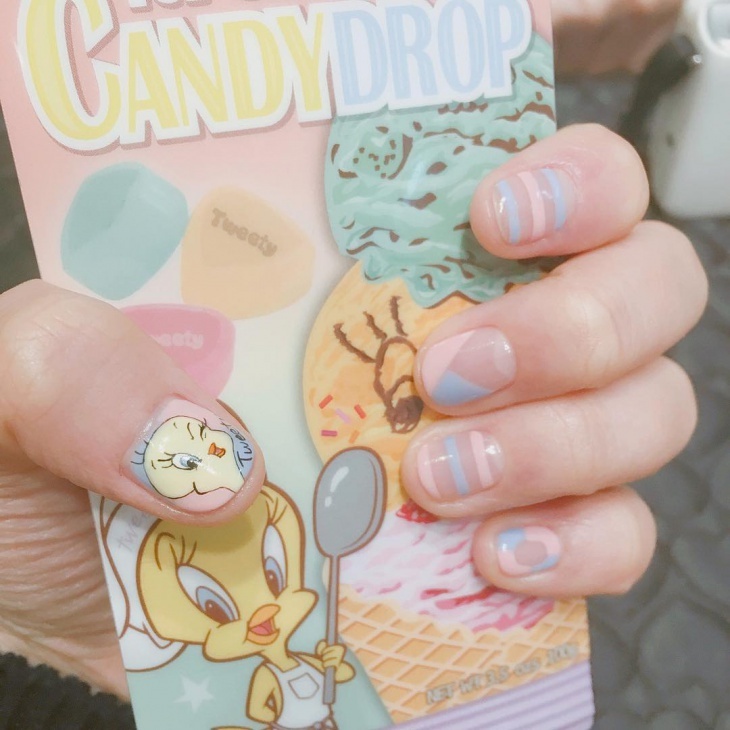 The ice-cream shades all around are extremely compelling, and the patterns make the art all the more trendy. 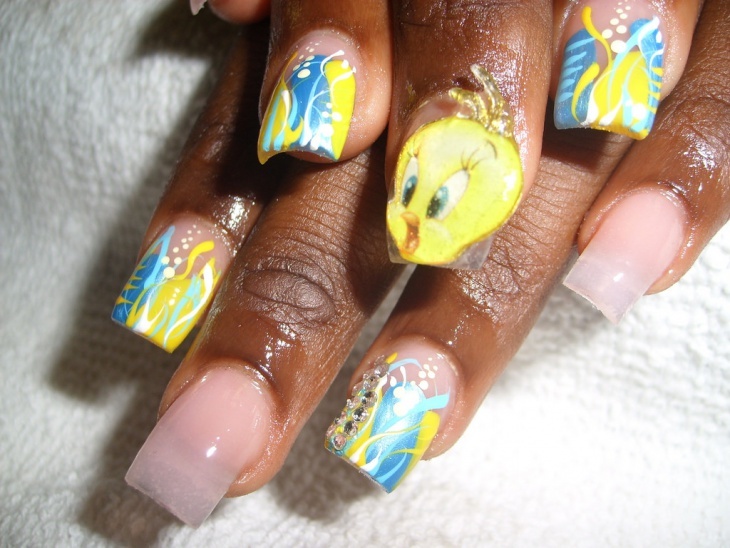 What really cinches the deal for this particular piece is the winking Tweety on the thumb. As with all gel art, don’t forget the setting top coat to add that extra sheen. 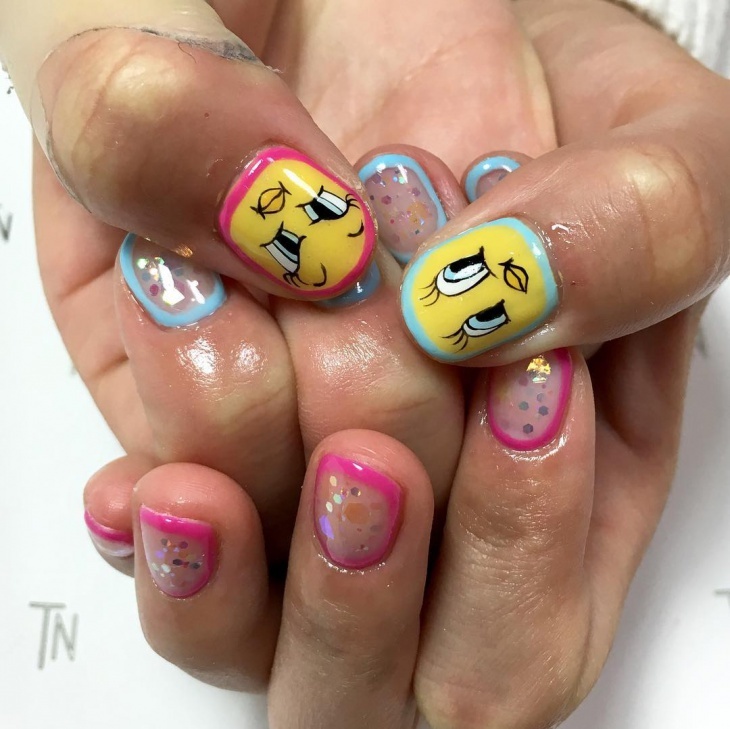 This is one unapologetically bold, true to the playful nature of the cartoon character and willing to let loose the cuteness to striking heights. This is brought out by the bright green and yellow shades of colour. 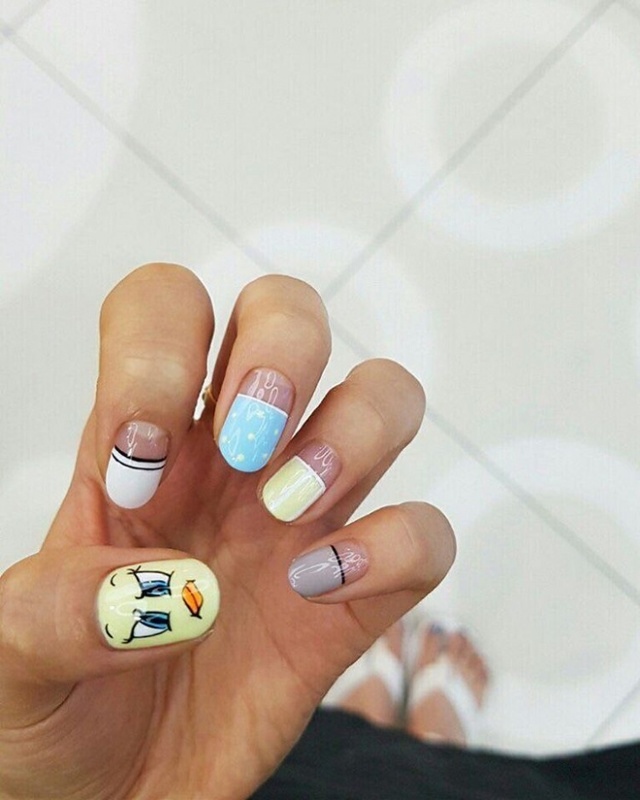 This piece of nail art is quite clever: the peppiness of the polka dots and symmetrical lines is offset by Tweety glaring, strategically placed on the thumb as though glowering at the perfection of the other nails. Here’s a great way to see Tweety come alive anywhere you go (TweetyGo, anyone?) – wiggle your toes! 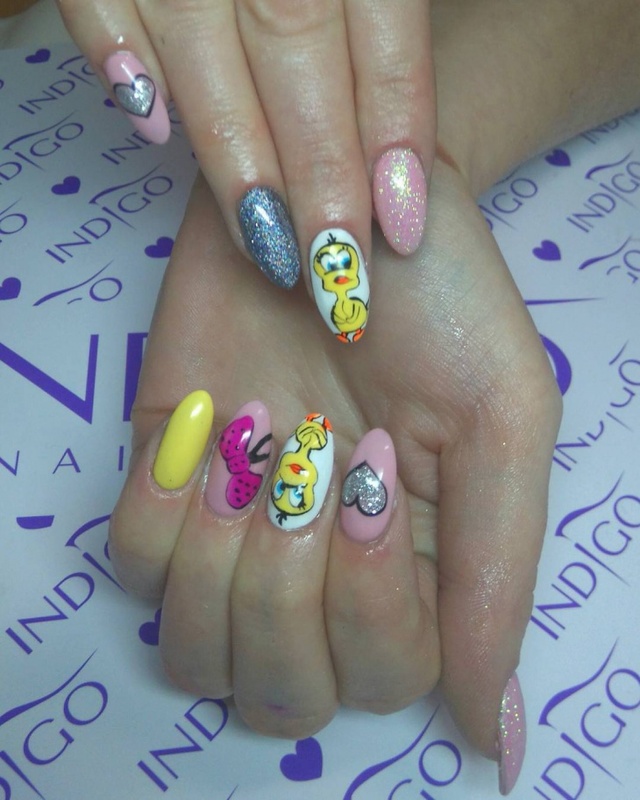 And finally, yet another way to play up those long tips of yours – paint it in different shades of glitter, pink and bird! 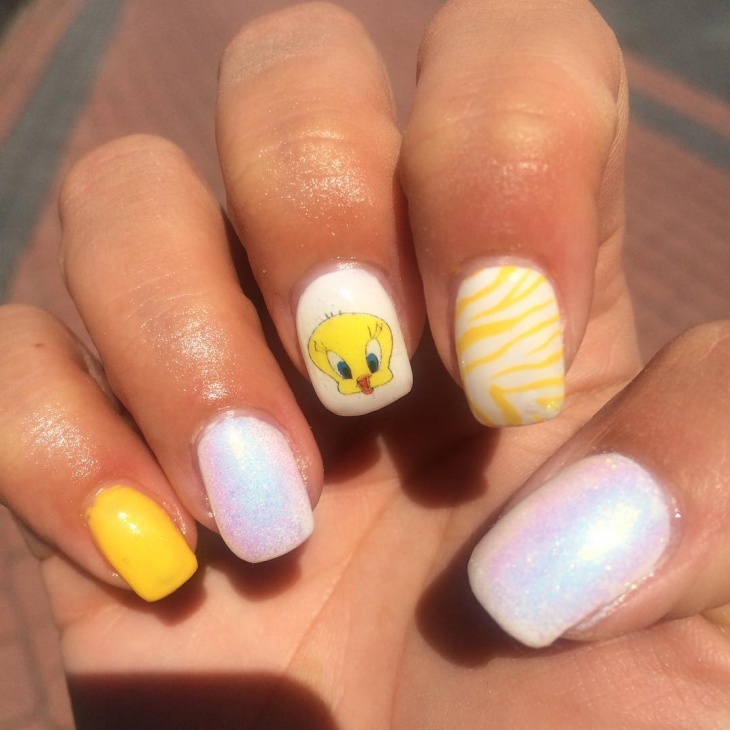 There you are, some great ideas for Tweety nail art. Don’t forget to send us your ideas as well, and experiment more with other cartoon characters. 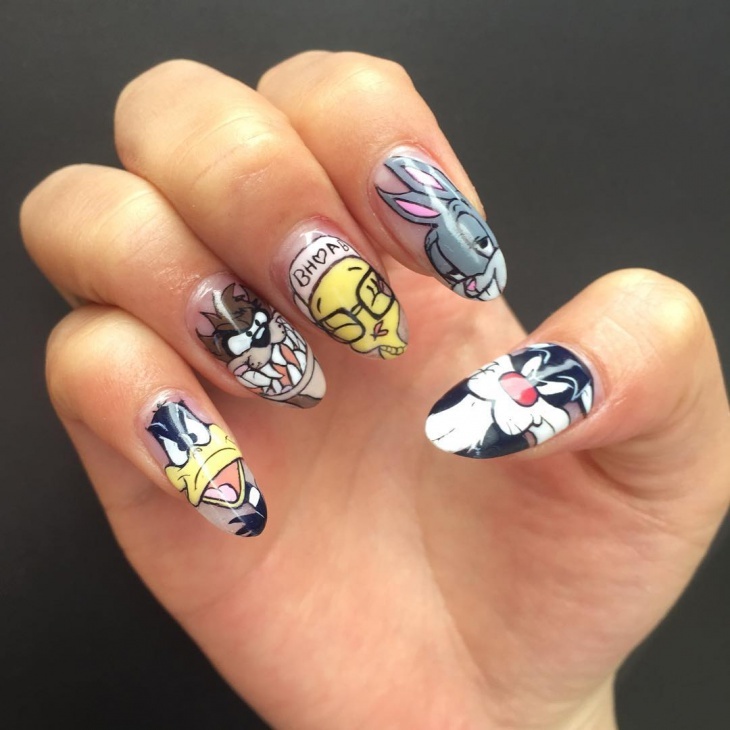 Who doesn’t want to see a scheming Tom, a smiling Jerry, the Jetsons jet-setting and Fred Flintstone on a dinosaur on their fingers!